Naissance des Pieuvres (Water Lilies) (Director: Céline Sciamma): One of those “coming of age” films that the French do so well. This one features three girls who meet at the local swimming pool while part of a synchronized swimming team. The trailer reminds me a lot of Lukas Moodysson’s Show Me Love, which was wonderful. My Kid Could Paint That (Director: Amir Bar-Lev): Marla Olmstead is an abstract painter whose paintings fetch up to $25,000 from collectors. She is also 7 years old. Her parents contacted the director in 2004 to make a film about her when critics began to charge that she was not actually the one creating her work, that perhaps her father (an amateur painter) was behind the striking paintings. In order to “clear her name,” her parents invited Bar-Lev to tell her story and film her at work. Despite the fact that Marla has never spoken much about her art, the film attempts to grapple with the question of her creativity. 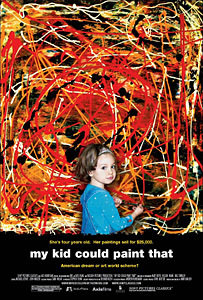 Is she really a modern art prodigy, or is she simply doing what all children do? This promises to be a wild ride. You, The Living (Du levande) (Director: Roy Andersson): I have yet to see Roy Andersson’s last film, the much-lauded Songs from the Second Floor (2000), but I seem to like deadpan Nordic comedies, and this comes highly recommended (or at least highly anticipated) from Bob Turnbull, who’s made it his top pick. 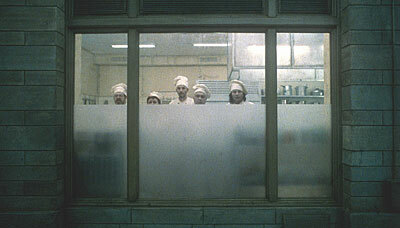 As well, the images from the film look so ghostly and beautiful at the same time. So it makes the list. This entry was posted in Film Festivals, TIFF and tagged TIFF. Bookmark the permalink.